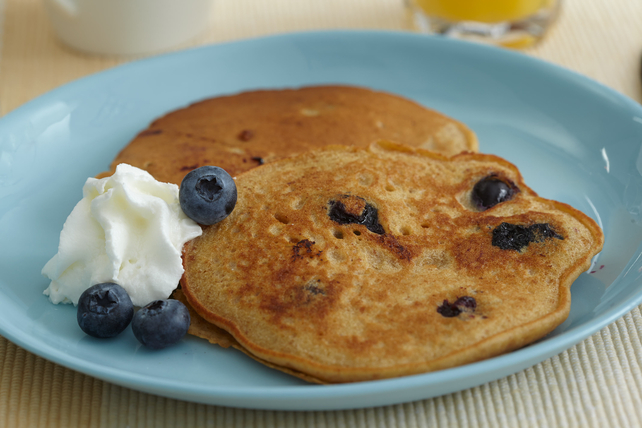 What's the secret ingredient in these tasty blueberry pancakes? Graham crumbs! These homemade blueberry pancakes are unbelievably good. Whisk egg, milk and honey with whisk until well blended. Add to flour mixture; stir just until blended. Gently stir in berries. Heat large skillet sprayed with cooking spray on medium heat. Ladle 1/4 cup batter into skillet for each pancake; cook 2-3 min. or until bubbles form on tops, then turn over to brown other sides. Prepare using frozen blueberries. For best results, do not thaw berries before adding them to the pancake batter.